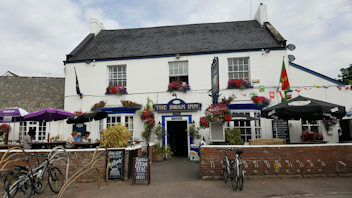 Lympstone is situated on the east side of the River Exe, on National Cycle Route 2, between Exmouth in the south and Topsham to the north. 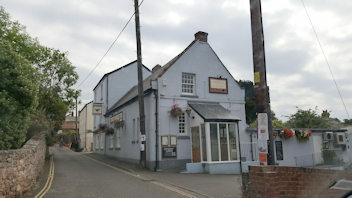 The main part of the village lays between the Exe and the A376 – Exmouth to Exeter road. But to the east of the village the Parish stretches right up to Lympstone Common. Lympstone is not just a great place to explore – visit the cobbled quays, the harbour or view fascinating architecture – from Grade listed buildings to contemporary dwellings. Visit the Parish Church or stroll along one of the many footpaths that criss-cross the village. But Lympstone is also a great base for exploring this fantastic and varied area. 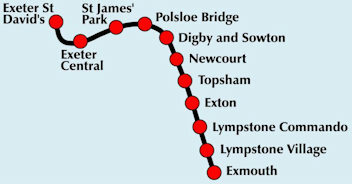 If what you are looking for in not in Lympstone – it will be within a very short distance by foot, by cycle, by train or by car. 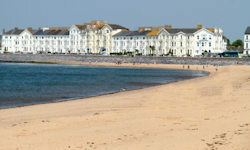 Or in the area ……..
Boasting one of the warmest climates in the UK, at the very beginning of the Jurassic Coast, Exmouth is one of the most picturesque holiday resorts on the south coast. 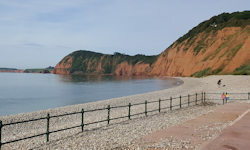 Walk the South West Coastal Path, sail along the Jurassic coast or the Exe River and Exmouth’s stunning beach stretch for miles. 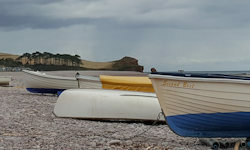 Sidmouth is a beautiful coastal town with a regency feel, It lies on the Jurassic Coast and the coastline is dominated by the vivid red sandstone cliffs. Sidmouth Beach is a perfect family friendly beach, ideal for safe swimming and rock pooling at low tide with great on site facilities. 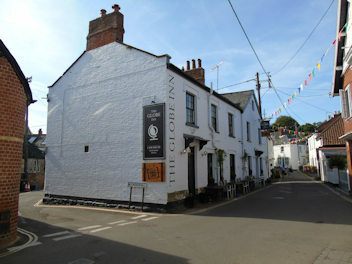 Once a thriving port and shipbuilding centre, Topsham still retains a strong maritime flavour. This quaint historic town has a cosmopolitan atmosphere with an eclectic cluster of specialist shops and fine restaurants. Visit Topsham Museum and see the elegant 17c Dutch-style merchant houses along The Strand. Visit the Quay Antiques Centre. 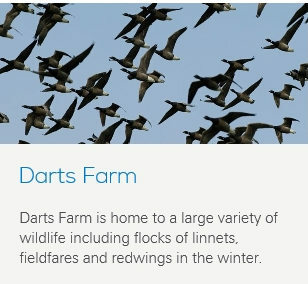 Walk information provided with help from Natural England. Map reproduced by permission of Ordnance Survey on behalf of HMSO. © Crown copyright and database right 2018. 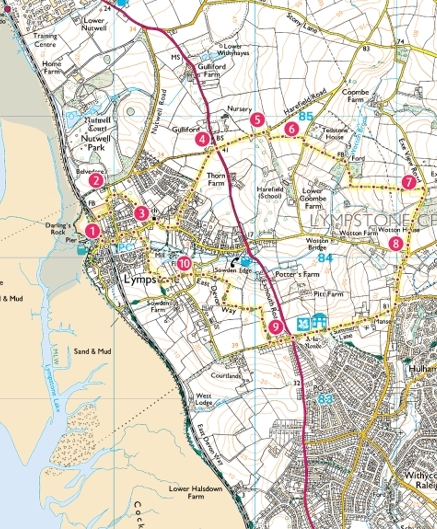 Ordnance Survey Licence number 100022021. 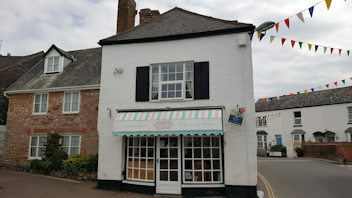 A level stroll along the Exe Estuary Cycle Trail to Exeter’s one-time main port, with its fine Regency waterfront buildings reflecting Topsham’s Dutch connections, brought by William of Orange when he arrived to take up the throne. 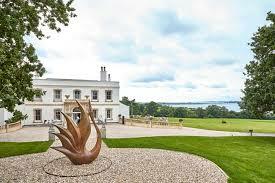 The route passes the elegant grounds and buildings of Nutwell Court and the Lympstone Commando Training Centre before leaving the riverbank to head into the town over the historic Clyst Bridge. Pause for lunch in Topsham before catching the train back to Lympstone. A walk inland, heading up into the hills above the village for spectacular views over the Exe Estuary and beyond. The route passes the church and some of Lympstone’s many listed buildings before dropping down an ancient lane to the Wotton Brook, while the return route features the unique Point-in-View Church and the National Trust’s eighteenth-century 16-sided house at A La Ronde (open to visitors). 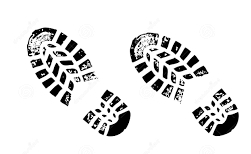 There is some gentle ascent and descent, and paths around fields may be muddy after rain. 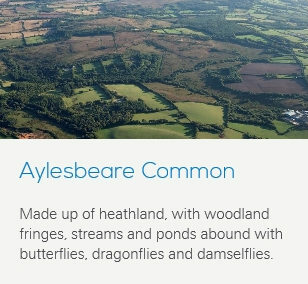 This 38 mile [60km] path takes you from Exmouth, in the west to Lyme Regis, Dorset in the east, and follows footpaths, bridleways and stretches of quiet lanes. 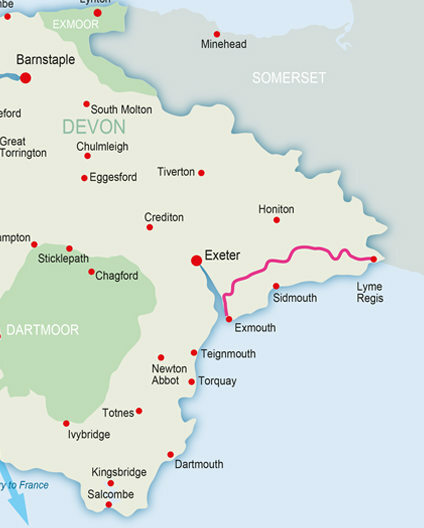 The route passes through the heart of the East Devon Area of Outstanding Natural Beauty (AONB), linking to the South West Coast Path, the beautiful Jurassic Coast World Heritage Site and the Exe Estuary. The route is presented from west to east in six stages and you can pick up short sections of the trail from a number of easily accessible points. 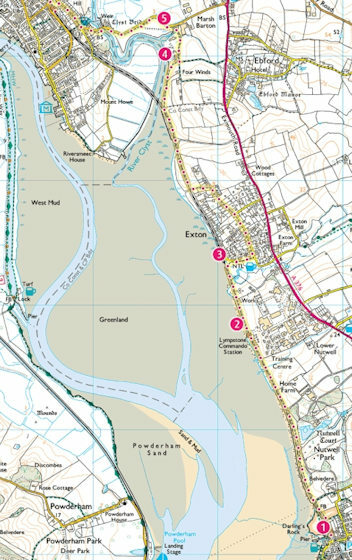 The Exe Explorer is your guide to the Exe Estuary Trail – and much more …. 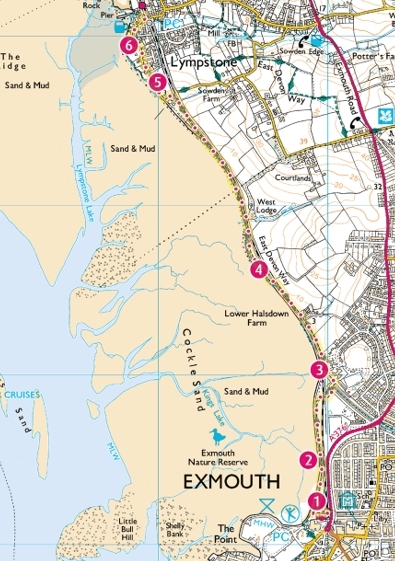 Also South Devon – Official Guide to the Region: Exe Estuary Trail More information on Where to Stay, What’s On, Food and Drink and images of along the Trail. 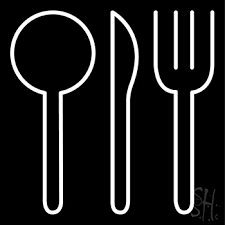 Click here for the Guide. National Cycle Network – Sustrans. Exe Estuary Trail is part of the National Cycle Route No.2 Visit the NCN here. 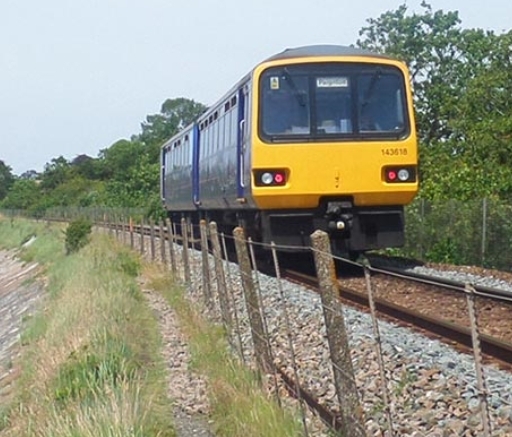 The Avocet Line is a busy, thriving and much-loved railway that runs the 9.5 miles along the eastern side of Devon’s Exe Estuary from the city of Exeter to the seaside resort of Exmouth. It’s scenic, but also a vital resource for daily travel to work, school and college and shopping. There are several ferry services operating on the Exe Estuary, many of which offer scenic cruises as well as foot ferries across the estuary. 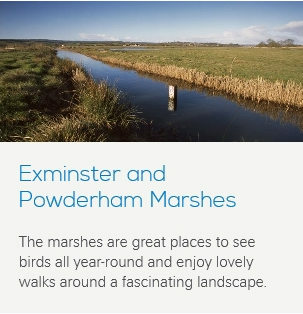 Sail from Exmouth throughout the year offering circular scenic cruises on the river, guided bird watching, summer coastal cruises and day trips to local towns: Topsham, Sidmouth and Torbay. All vessels have seating, refreshments and toilets on board. 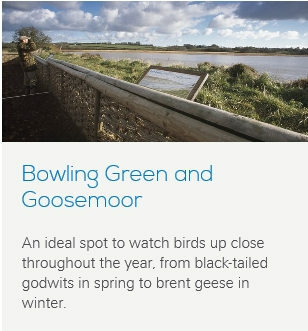 Starcross to Exmouth ferry, trips to Brixham, coastal cruises, fishing trips and bird watching cruises including winter RSPB Avocet Cruises. 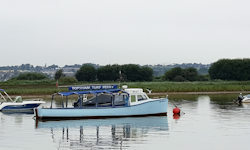 Topsham to Turf Locks and RSPB bird watching cruises. 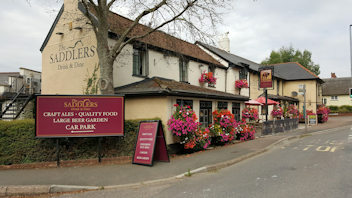 The Turf Locks Hotel is a family run pub serving great food, local ales and wines. 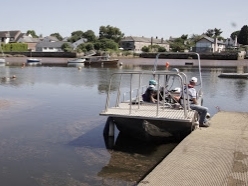 The ferry runs across the river Exe, between the landing in Ferry Road, Topsham, and Topsham Lock on the western bank of the river. There is no road access to Topsham Lock but it is on the Exe Valley Way walking route.